Children with astrocytoma may experience the following symptoms or signs. Sometimes, children with astrocytoma do not have any of these changes. Or, the cause of a symptom may be a different medical condition that is not a tumor. In a baby, the only symptom may be that the head is growing too fast. An infant’s skull can expand to make room for a growing tumor in the brain. So, a baby with astrocytoma may have a larger than expected head. If a tumor is diagnosed, relieving symptoms remains an important part of care and treatment. This may be called palliative care or supportive care. It is often started soon after diagnosis and continued throughout treatment. Be sure to talk with the health care team about the symptoms your child experiences, including any new symptoms or a change in symptoms. 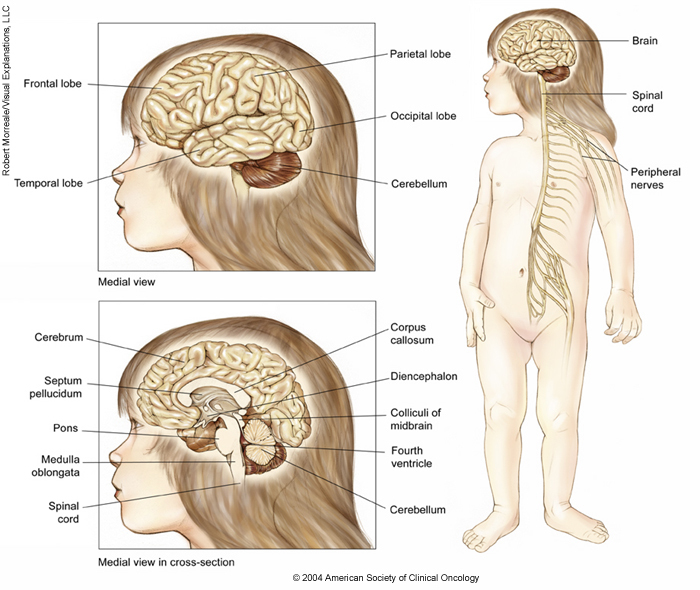 ON THIS PAGE: You will learn about how doctors describe astrocytoma’s growth or spread. This is called the stage or grade. Use the menu to see other pages. Staging is a way of describing where a tumor is located, if or where it has spread, and whether it is affecting other parts of the body. Several types of childhood CNS tumors can spread through the spinal fluid that surrounds the brain and the spine. This information helps the doctor plan treatment and determine the prognosis, which is the chance of recovery. In addition to staging, doctors also describe astrocytoma by its grade. The grade describes how much tumor cells look like healthy cells when viewed under a microscope. The doctor compares the tumor tissue with healthy tissue. Healthy tissue usually contains many different types of cells grouped together. If the tumor cells looks similar to healthy tissue and has different cell groupings, it is called "differentiated" or a "low-grade tumor." 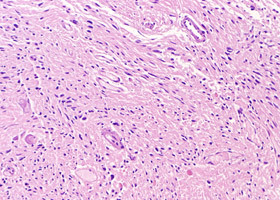 If the tumor tissue looks very different from healthy tissue, it is called "poorly differentiated" or a "high-grade tumor." The tumor’s grade may help the doctor predict how quickly it will spread. In general, the lower the tumor’s grade, the better the prognosis. Low-grade tumor. 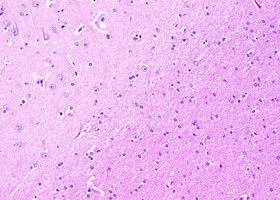 A low-grade tumor has cells that look similar to healthy CNS cells under a microscope. The tumor usually does not grow quickly or spread to other parts of the CNS. However, the tumor can sometimes grow and spread quickly. Tumors may appear in multiple spots in the brain, especially when the disease is linked with neurofibromatosis (see Risk Factors). 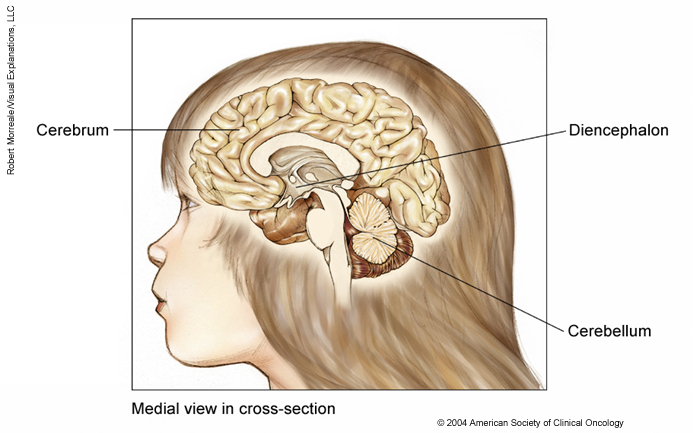 A common low-grade tumor in children is called juvenile pilocytic astrocytoma, or JPA. High-grade tumor. A high-grade tumor has cells that do not look similar to healthy astrocytes. This type of tumor grows quickly and can spread throughout the CNS. Recurrent astrocytoma. 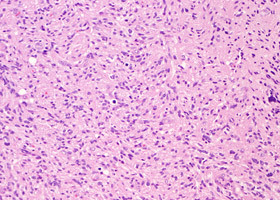 Recurrent astrocytoma is a tumor that has come back after treatment. Astrocytoma usually recurs near where it first started. If the tumor does return, there will be another round of tests to learn about the extent of the recurrence. These tests and scans are often similar to those done at the time of the original diagnosis. Information about the tumor’s grade and stage will help the doctor recommend a specific treatment plan. The next section in this guide is Types of Treatment. Use the menu to choose a different section to read in this guide. ON THIS PAGE: You will learn about the different types of treatments doctors use for children with astrocytoma. Use the menu to see other pages. In general, tumors in children are uncommon. This means it can be hard for doctors to plan treatments unless they know what has been most effective in other children. That is why more than 60% of children are treated as part of a clinical trial. A clinical trial is a research study that tests a new approach to treatment. The “standard of care” is the best treatments known. Clinical trials may test such approaches as a new drug, a new combination of existing treatments, or new doses of current therapies. The health and safety of all children participating in clinical trials are closely monitored. To take advantage of these newer treatments, children with a CNS tumor should be treated at a specialized cancer center. Doctors at these centers have extensive experience in treating children and have access to the latest research. A doctor who specializes in treating children with a tumor is called a pediatric oncologist. For astrocytoma, a neuro-oncologist may also be involved with treatment. This is a doctor who specializes in CNS tumors. If a pediatric cancer center is not nearby, general cancer centers sometimes have pediatric and neurology specialists who are able to be part of your child’s care. In many cases, a team of doctors works with a child and the family to provide care. This is called a multidisciplinary team. Pediatric cancer centers often have extra support services for children and their families, such as child life specialists, dietitians, physical and occupational therapists, social workers, and counselors. Special activities and programs to help your child and family cope may also be available. Descriptions of the common types of treatments used for astrocytoma are listed below, including other treatments called targeted therapy and immunotherapy that may be available through clinical trials. Your child’s care plan also includes treatment for symptoms and side effects, an important part of cancer care. Treatment options and recommendations depend on several factors, including the type and grade of the tumor, possible side effects, the family’s preferences, and the child’s overall health. Take time to learn about all of your child’s treatment options and be sure to ask questions about things that are unclear. Talk with your child’s doctor about the goals of each treatment and what you can expect during the treatment. These types of talks are called "shared decision making." Shared decision making is when you and your doctors work together to choose treatments that fit the goals of your child's care. Shared decision making is particularly important for astrocytoma because there are different treatment options. Learn more about making treatment decisions. Surgery is the removal of the tumor and some surrounding healthy tissue during an operation. It is the most common treatment for astrocytoma. During surgery, a neurosurgeon removes as much of the tumor as possible. Sometimes, a tumor is inoperable, meaning it cannot be reached by surgery because of its location. However, even for inoperable tumors, a surgical biopsy can usually still be done to find out the type and grade of the tumor (see Diagnosis). If a low-grade tumor cannot be completely removed, the doctor usually watches for signs of tumor growth before considering other types of treatment. If a tumor causes symptoms and cannot be completely removed with surgery, radiation therapy or chemotherapy is often used. A child with a high-grade tumor often needs additional treatment regardless of whether the entire tumor was removed during surgery. Before surgery, talk with your child’s health care team about the possible side effects from the recommended surgery. Learn more about the basics of surgery. Radiation therapy is the use of high-energy x-rays or other particles to destroy tumor cells. A doctor who specializes in giving radiation therapy to treat a tumor is called a radiation oncologist. The most common type of radiation treatment is called external-beam radiation therapy, which is radiation given from a machine outside the body. When radiation treatment is given using implants, it is called internal radiation therapy or brachytherapy. A radiation therapy regimen, or schedule, usually consists of a specific number of treatments given over a set period of time. Side effects from radiation therapy may include fatigue, mild skin reactions, upset stomach, and loose bowel movements. Most short-term side effects go away soon after treatment in finished. Radiation therapy can sometimes cause problems with the long-term growth and development of a child’s brain. This means that the doctor may choose to treat the tumor in another way. To avoid or reduce the need for radiation therapy in young children, the doctor may first use chemotherapy to shrink the tumor. Systemic therapy is the use of medication to destroy cancer cells. This type of medication is given through the bloodstream to reach cancer cells throughout the body. Systemic therapies are generally prescribed by a pediatric hematologist-oncologist, a doctor who specializes in treating cancer in children with medication. The medications used to treat cancer are continually being evaluated. Talking with your child’s doctor is often the best way to learn about the medications prescribed for your child, their purpose, and their potential side effects or interactions with other medications. It is also important to let your doctor know if your child is taking any other prescription or over-the-counter medications or supplements. Herbs, supplements, and other drugs can interact with cancer medications. Learn more about your child’s prescriptions by using searchable drug databases. Chemotherapy is the use of drugs to destroy tumor cells, usually by keeping the tumor cells from growing, dividing, and making more cells. A chemotherapy regimen, or schedule, usually consists of a specific number of cycles given over a set period of time. A patient may receive a single drug at a time or combinations of different drugs given at the same time. Chemotherapy for astrocytoma is often a combination of 2 or 3 drugs. Chemotherapy may be used to delay or avoid using radiation therapy in young children with low-grade tumors, such as JPA, due to possible side effects. For a high-grade tumor, chemotherapy may work better when combined with surgery and radiation therapy. Targeted therapy is a treatment that targets the tumor’s specific genes, proteins, or the tissue environment that contributes to the tumor’s growth and survival. This type of treatment blocks the growth and spread of tumor cells while limiting damage to healthy cells. Not all tumors have the same targets. To find the most effective treatment, your child’s doctor may run tests to identify the genes, proteins, and other factors in the tumor. This helps doctors better match each child with the most effective treatment whenever possible. In addition, research studies continue to find out more about specific molecular targets and new treatments directed at them. Learn more about the basics of targeted treatments. Larotrectinib (Vitrakvi) is a type of targeted therapy that is not specific to a certain type of cancer but focuses on a specific genetic change called an NTRK fusion. This is also called a tumor-agnostic treatment. This type of genetic change is found in a range of cancers, including astrocytoma. Larotrectinib is approved as a treatment for astrocytoma that is metastatic or cannot be removed with surgery and has worsened with other treatments. Talk with your child’s doctor to learn more about treatment options within a clinical trial. In addition, ask about possible side effects for a specific medication and how they can be managed. Immunotherapy for astrocytoma is currently being researched in clinical trials. Talk with your child’s doctor to learn more about treatment options within a clinical trial. Different types of immunotherapy can cause different side effects. Common side effects include skin reactions, flu-like symptoms, diarrhea, and weight changes. Talk with your child’s doctor about possible side effects for the immunotherapy recommended for your child. Learn more about the basics of immunotherapy. A CNS tumor and its treatment cause physical symptoms and side effects, as well as emotional, social, and financial effects. Managing all of these effects is called palliative care or supportive care. It is an important part of your child’s care that is included along with treatments intended to slow, stop, or eliminate the tumor. Palliative care focuses on improving how your child feels during treatment by managing symptoms and supporting patients and their families with other, non-medical needs. Any person, regardless of age or type and stage of the tumor, may receive this type of care. And it often works best when it is started right after a CNS tumor diagnosis. People who receive palliative care along with treatment for the tumor often have less severe symptoms, better quality of life, and report they are more satisfied with treatment. Palliative treatments vary widely and often include medication, nutritional changes, relaxation techniques, emotional and spiritual support, and other therapies. Your child may also receive palliative treatments similar to those meant to get rid of the tumor, such as chemotherapy, surgery, or radiation therapy. Before treatment begins, talk with your child’s doctor about the goals of each treatment in the treatment plan. You should also talk about the possible side effects of the specific treatment plan and palliative care options. During treatment, your child’s health care team may ask you to answer questions about your child’s symptoms and side effects and to describe each problem. Be sure to tell the health care team if your child are experiencing a problem. This helps the health care team treat any symptoms and side effects as quickly as possible. It can also help prevent more serious problems in the future. A remission is when tumor cells cannot be detected in the body and there are no symptoms. This may also be called having “no evidence of disease” or NED. A remission may be temporary or permanent. This uncertainty causes many people to worry that the tumor will come back. While many remissions are permanent, it is important to talk with the doctor about the possibility of the disease returning. Understanding your child’s risk of recurrence and the treatment options may help you feel more prepared if the tumor does return. Learn more about coping with the fear of recurrence. If the tumor returns after the original treatment, it is called a recurrent tumor. It may come back in the same place (called a local recurrence), nearby (regional recurrence), or in another place (distant recurrence). When astrocytoma recurs, it usually recurs near where the tumor originally started. When this occurs, a new cycle of testing will begin again to learn as much as possible about the recurrence. After this testing is done, you and your child’s doctor will talk about the treatment options. Often the treatment plan will include the treatments described above such as surgery, radiation therapy, and chemotherapy, but they may be used in a different combination or given at a different pace. Your child’s doctor may suggest clinical trials that are studying new ways to treat this type of recurrent tumor. Whichever treatment plan you choose, palliative care will be important for relieving symptoms and side effects. If the tumor is a low-grade recurrent astrocytoma, the doctor may perform surgery to remove as much of the tumor as possible. Children who have not previously had radiation therapy or chemotherapy may receive either or both of these treatments for the recurrent tumor. If the tumor is a high-grade recurrent astrocytoma, the doctor may suggest other types of chemotherapy or radiation therapy. Rarely, chemotherapy along with stem cell/bone marrow transplantation may be recommended. Although treatment is successful for the majority of children with a CNS tumor, sometimes it is not. If a child’s tumor cannot be cured or controlled, this is called an advanced or terminal tumor. This diagnosis is stressful, and an advanced tumor may be difficult to discuss. However, it is important to have open and honest conversations with your child’s health care team to express your family’s feelings, preferences, and concerns. The health care team has special skills, experience, and knowledge to support patients and their families and is there to help. Hospice care is designed to provide the best possible quality of life for people who are expected to live less than 6 months. Parents and guardians are encouraged to talk with the health care team about hospice options, which include hospice care at home, a special hospice center, or other health care locations. Nursing care and special equipment can make staying at home a workable option for many families. Some children may be happier if they can attend school part-time or keep up other activities and social connections. The child’s health care team can help parents or guardians decide on an appropriate level of activity. Making sure a child is physically comfortable and free from pain is extremely important as part of end-of-life care. Learn more about caring for a terminally ill child and advanced care planning. The next section in this guide is About Clinical Trials. It offers more information about research studies that are focused on finding better ways to care for children with astrocytoma. Use the menu to choose a different section to read in this guide. Visit the Cancer.Net Blog to review research announced at the 2017 ASCO Annual Meeting on decreases in long-term health problems of childhood cancer survivors. ON THIS PAGE: You will find some questions to ask your child’s health care team, to help you better understand your child’s diagnosis, treatment plan, and overall care. Use the menu to see other pages. Talking often with your child's health care team is important to make informed decisions about your child’s health care. These suggested questions are a starting point to help you learn more about your child’s care and treatment. You are also encouraged to ask additional questions that are important to you. You may want to print this list and bring it to your child’s next appointment, or download Cancer.Net’s free mobile app for a digital list and other interactive tools to manage your child’s care. It may also be helpful to ask a family member or friend to come with you to appointments to help take notes. Where exactly is the astrocytoma located? What is the grade of the tumor? What does this mean? Are there other treatment options available at other cancer centers? Who should I contact about any side effects my child experiences? And how soon? What are the possible long-term effects of surgery? ON THIS PAGE: You will find some helpful links to other areas of Cancer.Net that provide information about medical care and treatment. This is the final page of Cancer.Net’s Guide to Childhood Astrocytoma. Use the menu to go back and see other pages. Cancer.Net includes many other sections about the medical and emotional aspects of being diagnosed with a tumor for the patient and their family members and friends. This website is meant to be a resource for you and your loved ones from the time of diagnosis, through treatment, and beyond. Read more about the first steps to take when your child is diagnosed with a tumor. Find a national, not-for-profit advocacy organization that may offer additional information, services, and support for people with astrocytoma. To find a range of information and insights from different voices on timely topics, visit the Cancer.Net Blog. This is the end of the Cancer.Net’s Guide to Childhood Astrocytoma. Use the menu to choose a different section to read in this guide.